Annette Carol Bening (born May 29, 1958) is an American actress. She began her career on stage with the Colorado Shakespeare Festival company in 1980, and played Lady Macbeth in 1984 at the American Conservatory Theatre. She was nominated for the 1987 Tony Award for Best Featured Actress in a Play for her Broadway debut in Coastal Disturbances. She is a four-time Academy Award nominee; for the films The Grifters (1990), American Beauty (1999), Being Julia (2004) and The Kids Are All Right (2010). In 2006, she received a star on the Hollywood Walk of Fame. After her film debut in the 1988 film The Great Outdoors, she starred in Valmont (1989), Bugsy (1991), The American President (1995), The Siege (1998), Open Range (2003) and Running with Scissors (2006). She won the BAFTA Award for Best Actress and the Screen Actors Guild Award for Best Actress for American Beauty; Golden Globe Awards for Being Julia and The Kids Are All Right, and was nominated for a 2006 Emmy Award for Mrs. Harris. Bening was born in Topeka, Kansas, the daughter of Shirley Katherine (née Ashley; b. 1929) and Arnett Grant Bening. Her mother was a church singer and soloist, and her father was a sales training consultant and insurance salesman. Her parents, natives of Iowa, were practicing Episcopalians and conservative Republicans. She is of mostly German and English descent. Bening has one sister, Jane, and two brothers, Bradley and Byron. The family moved to Wichita, Kansas in 1959, where she spent her early childhood. In 1965, her father took a job with a company in San Diego, California, and they moved there. She began acting in junior high school, playing the lead in The Sound of Music. She graduated in 1975 from Patrick Henry High School, where she studied drama. She then spent a year working as a cook on a charter boat taking fishing parties out on the Pacific Ocean, and scuba diving for recreation. Bening attended San Diego Mesa College, then completed an academic degree in theatre arts at San Francisco State University. Bening began her career on stage with the Colorado Shakespeare Festival company in 1980, and appeared in plays at the San Diego Repertory Theatre. She was a member of the acting company at the American Conservatory Theater in San Francisco while studying acting as part of the Advanced Theatre Training Program. There, she starred in such productions as Shakespeare's Macbeth as Lady Macbeth. Bening also starred in productions of Pygmalion and The Cherry Orchard at the Denver Center Theatre Company during the 1985–86 season. She made her Broadway debut in 1987, garnering a Tony Award nomination for Best Featured Actress in a Play for her performance in Coastal Disturbances. Bening made her film debut in The Great Outdoors (1988). Her second film appearance was as the Marquise de Merteuil in Valmont (1989), opposite Colin Firth. Her breakthrough role was in The Grifters (1990), which starred John Cusack and Anjelica Huston, and earned Bening a nomination for the Academy Award for Best Supporting Actress. In 1991, she portrayed Virginia Hill in Barry Levinson's biopic Bugsy, alongside Warren Beatty. Later, she appeared in Regarding Henry with Harrison Ford. In 1994, Bening and Beatty starred in Love Affair, which also featured Katharine Hepburn. In 1995, Bening appeared in The American President, followed by Tim Burton's sci-fi spoof Mars Attacks! (1996). In 1998, she co-starred with Denzel Washington and Bruce Willis in The Siege. The biggest critical and commercial success of her career thus far was the 1999 film American Beauty, which won the Academy Award for Best Picture and was directed by Sam Mendes. For this performance, Bening was nominated for an Academy Award for Best Actress and won the Screen Actors Guild Award for Outstanding Performance by a Female Actor in a Leading Role. Bening also starred in the films In Dreams (1999) and What Planet Are You From? (2000). Bening played Sue Barlow, Charley Waite's love interest, in Open Range (2003). In 2004, she played the title role in Being Julia, which earned her a Golden Globe Award for Best Actress and her second Academy Award nomination for Best Actress. She was nominated for a Primetime Emmy Award for her portrayal of Jean Harris the 2005 HBO film Mrs. Harris. In 2006, she replaced Julianne Moore to star in the film adaptation of Running with Scissors. In December of that year, Bening hosted Saturday Night Live with musical guests Gwen Stefani and Akon. In 2008, Bening starred in The Women. In 2009, Bening starred in a new interpretation of the Euripides classic Medea at UCLA's Freud Playhouse. The following year, she received positive reviews for her performance in the independent film Mother and Child (2009). In 2010, she starred in Joanna Murray-Smith’s comedy The Female of the Species at the Geffen Playhouse in Los Angeles. Later that year, Bening received strong critical acclaim for her performance in The Kids Are All Right, with several reviewers noting that she "deserves an Oscar" for her "sublime" performance. For that role, Bening won a second Golden Globe Award, and received Academy Award and Screen Actors Guild Award nominations. In 2012, Bening's audiobook recording of Virginia Woolf's Mrs. Dalloway was released at Audible.com. It was announced in May 2014 that she would join John Lithgow in Shakespeare's King Lear at the Delacorte Theater in Central Park, as part of the Public Theatre's Free Shakespeare in the Park. It marked her first New York stage appearance in 20 years. 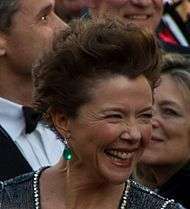 In 2016, Bening portrayed the lead role of Dorothea Fields in the comedy-drama 20th Century Women, in which her performance has been acclaimed. Bening was married to choreographer J. Steven White from May 26, 1984 until they divorced in 1991. She has been married to actor Warren Beatty since March 3, 1992. They have four children: Stephen Ira (born January 8, 1992), Benjamin (born August 23, 1994), Isabel (born January 11, 1997), and Ella (born April 8, 2000). Bening was ordained as a minister by the Universal Life Church Monastery. 1987 Miami Vice Vicky Episode: "Red Tape"
1987 Wiseguy Karen Leland Episode: "One on One"
2004 The Sopranos Herself Episode: "The Test Dream"
2006 Saturday Night Live Herself – Host Episode: "Annette Bening/Gwen Stefani & Akon"
↑ "#83 Royal Descents, Notable Kin, and Printed Sources: A Third Set of Ten Hollywood Figures (or Groups Thereof), with a Coda on Two Directors". AmericanAncestors.org. April 18, 2008. Retrieved January 21, 2013. ↑ "Public Record of Shirley Bening". FamilySearch. Retrieved February 21, 2015. ↑ "Annette Bening Biography (1958–)". FilmReference.com. Retrieved May 3, 2010. ↑ "Putting 'Real Life' First Makes Bening A Better Actress". Nl.newsbank.com. Retrieved January 21, 2013. ↑ "Annette Bening Biography". TV Guide. Retrieved February 23, 2011. ↑ Dutka, Elaine (February 21, 1999). "The Aura of Annette; If She Makes the Merging of Career and Family Appear Effortless, It's an Illusion". Los Angeles Times. Retrieved April 29, 2008. ↑ Thomson, Desson (October 24, 2004). "Annette Bening, Acting on Her Maternal Instincts". The Washington Post. Retrieved May 3, 2010. ↑ "Love's Labour's Lost (1980 Colorado Shakespeare Festival)". Internet Shakespeare Editions. Retrieved May 29, 2016. ↑ Fleming, Michael (September 23, 1998). "Bening in 'Beauty': Actress close to joining Spacey in DW pic". Variety. ↑ "Annette Bening Emmy Nominated". Emmys.com. July 19, 2012. Retrieved January 21, 2013. ↑ "UCLA Live's new season: Annette Bening stars in world premiere". Los Angeles Times. June 3, 2009. ↑ Scott, A. O. (May 7, 2010). "In a Melancholy Los Angeles, 'La Ronde' of Motherhood". The New York Times. Retrieved February 23, 2011. ↑ "She's So Under the Gun, She Can't Leave Her Desk". The New York Times. March 1, 2010. ↑ "At the Movies: The Kids Are All Right". ABC Australia. Retrieved February 23, 2011. ↑ Gordon, David (May 20, 2014). "Annette Bening, Jessica Hecht, and More Will Join John Lithgow in Shakespeare in the Park's King Lear". TheaterMania.com. Retrieved September 19, 2015. ↑ "Annette Bening, Jessica Collins, Jessica Hecht Will Be John Lithgow's Daughters in King Lear". Playbill. May 20, 2014. Retrieved September 19, 2015. ↑ McNary, Dave (May 14, 2015). "Annette Bening, Greta Gerwig, Elle Fanning Join '20th Century Women'". Variety. ↑ Tauber, Michelle (January 8, 2015). "Stephen Ira: Warren Beatty and Annette Bening's Son Tweets About Leelah Alcorn". People. Retrieved October 20, 2016. ↑ "Annette Bening". Universal Life Church Ministers. November 20, 2014. Retrieved September 19, 2015. ↑ "Meet Elle's 2014 Women in Hollywood". Elle. October 9, 2014. Wikimedia Commons has media related to Annette Bening.